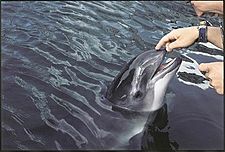 Porpoises are mammals that live in the ocean. They are in the order Cetacea. They form the family Phocoenidae. There are six species of porpoise. Porpoises look much like dolphins, but they are different in some ways: They are smaller and more stout. They have spade-shaped teeth, rounded heads, blunt jaws, and triangular dorsal fins. Porpoise Facts for Kids. Kiddle Encyclopedia.